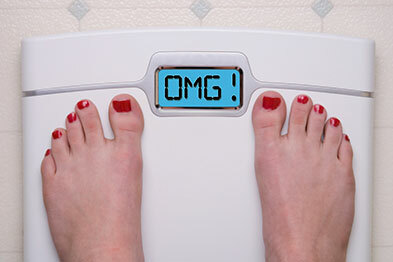 So how do you keep your weight intact through the holidays? It may sound counterintuitive, but don’t skip meals! You might think that starving yourself the day of a big party to “conserve calories” is a good idea, but this doesn’t work. By the time of the party, most people are so hungry they make poor food decisions and overeat, leaving them worse off than if they would have eaten on a regular schedule. If you are headed to a party, fuel yourself throughout the day with lean proteins, fruits and veggies, and complex carbohydrates – such as brown rice or quinoa – to keep you full. That way, when you get to the party, you aren’t setting yourself up for failure especially when there is so much temptation. Another way to stave off those extra pounds is when you’re asked to bring a dish to pass, pick something healthy. Don’t bring the cheesy artichoke dip. Try a vegetable platter with a yogurt dip, fruit plate, or salad. That way, you’ll know for sure that there will be at least one healthy option for you! Now the holidays are notorious for disrupting our daily schedules, but you still need to take the time to stick to your healthy routines…that means enjoying healthy meals and getting regular workouts. While you might not have time to hit the gym for an hour every day, even doing 15 minutes of some sort of cardiovascular activity mixed with strength training can help keep your body active and your mind health-focused. As for food, in the end, it’s all about calories in versus calories out. Choose your foods wisely to help keep yourself full so that you don’t splurge on unhealthy goodies. Speaking of unhealthy goodies…everyone enjoys a holiday cocktail or two, so we’re not saying avoid alcohol. Just be mindful of what you choose to drink. Alcohol contains more calories than most people realize and these calories aren’t going to fill you up or keep you from eating. In fact, alcohol is more likely to cause you to lower your inhibitions and go to town on the Christmas cookies. So, stay aware of what and how much you’re drinking. Choose a glass of wine, or a light beer, and try to avoid the creamy, high calorie drinks! Now picture this. You’re standing in front a long buffet table just loaded with holiday food. What do you do? Do you start at one end and load up as you go? Not the best plan. The best choice is to look at the whole spread first before making your food decisions. By doing this, you can make decisions about what you want to primarily fill your plate with, which should be proteins and veggies. Then, pick your sides which may be unhealthier, but because your plate will be full of healthier options, you eat the less unhealthy foods in smaller portions.